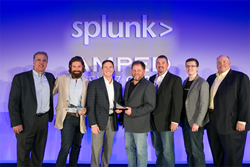 ClearShark today announced it has received the Splunk Public Sector Partner of the Year for exceptional performance and commitment to Splunk’s Partner+ Program. The Public Sector Partner of the Year Award recognizes a Splunk Public Sector partner who has performed at the top level, exhibited remarkable year-over-year growth, and demonstrated its commitment to the partnership by expanding its workforce and investing in Splunk education for its engineering and sales teams. Learn more about Splunk’s Partner+ Program here. "ClearShark’s customers are dealing with an ever-increasing and very dynamic threat environment. As a company founded with a “customer first” attitude, we only deliver the best overall cybersecurity solutions. We are proud to have Splunk be the cornerstone of these solutions,” says Roger Niles, Vice President of Sales at ClearShark. ClearShark, a 2014 and 2015 Inc. 5000 company, is an IT Solutions Provider and Systems Integrator partnering with industry-leading innovators to maximize our customers’ investments. Our highly experienced, credentialed sales team delivers the best overall cybersecurity, enterprise storage, virtualization, high performance computing, datacenter, and cloud infrastructure solutions to our federal and commercial customers.